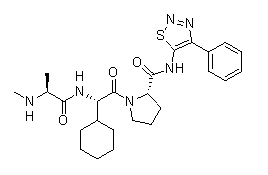 ASTX660 is an orally bioavailable dual antagonist of cellular inhibitor of apoptosis protein (cIAP) and X-linked inhibitor of apoptosis protein (XIAP). AT-406 is an orally bioavailable potent IAP of XIAP, cIAP1, and cIAP2 with Ki of 66.4 nM, 1.9 nM, and 5.1 nM, respectively. SM-164 is a potent cell-permeable and bivalent Smac mimetic which bind to a XIAP protein and binds to cIAP-1 and cIAP-2 proteins. 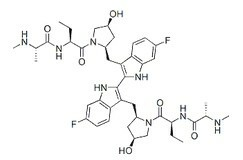 It is developed as an anticancer agent. It plays its antitumor roles through inducing degradation of cellular inhibitor of apoptosis protein (cIAP)-1/2, antagonizing X-linked inhibitor of apoptosis protein (XIAP) and inducing TNFα–dependent apoptosis in tumor cells. 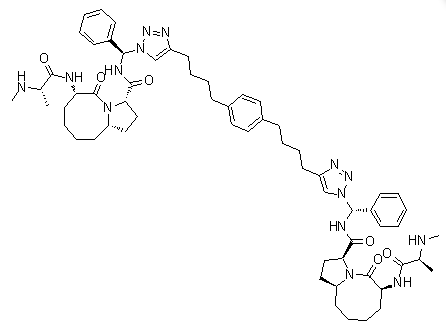 SM-164 is a bivalent mimetic containing two SM-122 analogues. It binds to cIAP-1 protein containing bothBIR2 and BIR3 domains, cIAP-2 BIR3 protein and XIAP protein containing both BIR2 and BIR3 domains. AZD5582 is a novel class of dimeric Smac mimetics as potent IAP antagonist; binds potently to the BIR3 domains of cIAP1, cIAP2, and XIAP (IC50 = 15, 21, and 15 nM, respectively). 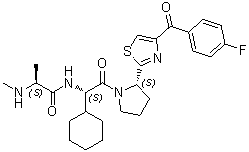 GDC-0152 is a potent inhibitor of IAPs; binds to the XIAP BIR3 domain, the BIR domain of ML-IAP, and the BIR3 domains of cIAP1 and cIAP2 with K(i) values of 28, 14, 17, and 43 nM, respectively. BV6 is a small-molecule Smac mimetic, which antagonizes IAP and induces autoubiquitination and subsequent proteasomal degradation of cIAP1 and cIAP2. 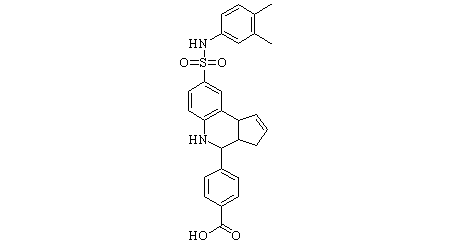 Birinapant, also known as TL32711, is a synthetic small molecule and peptido mimetic of second mitochondrial-derived activator of caspases and inhibitor of IAP (Inhibitor of Apoptosis Protein) family proteins, with potential antineoplastic activity. 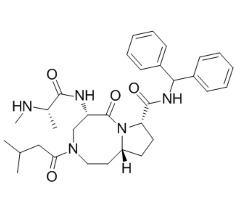 LCL161 is an oral small molecule antagonist of Inhibitor of Apoptosis Proteins (IAPs) that sensitizes a subset of tumors from diverse lineages to treatment with cytotoxic therapies.